This charming Pierrot brooch has a nice provenance, it comes from Doris Duke’s personal jewelry collection. It was made for Van Cleef & Arpels designed and patented by Maurice Duvalet in 1949. Duvalet worked both for Van Cleef & Arpels and John Rubel & Co. and was most famous for his ballerina brooches that he designed for both companies. 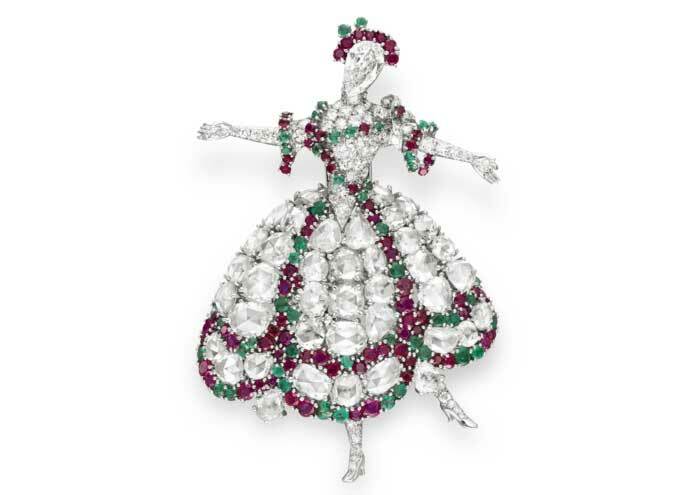 One of the masterpieces at the Rare Jewels and Objets d’Art: A Superb Collection at Christies NY in 2009 was the diamond ruby and emerald “ballerina” brooch. Several ballerina brooches had been designed in the late thirties by Maurice Duvalet for the New York branch of Van Cleef & Arpels. This particular brooch depicts Maria Camargo, a Spanish star ballet dancer from the 18th century, posed in arabesque. The use of emeralds and rubies resulted in a brilliant rendering of the flowers set on her costume as pictured by a French painting from Nicolas Lancret. Maurice Duvalet designed this particular piece in 1942 and used mainly rose-cut diamonds which are reputed to have originated from the Spanish Crown Jewels. This piece was manufactured by John Rubel & Co, the usual manufacturer for Van Cleef & Arpels New York. Estimated by Christie’s at $80,000 to $120,000, the brooch reached $350,000 (before commission). 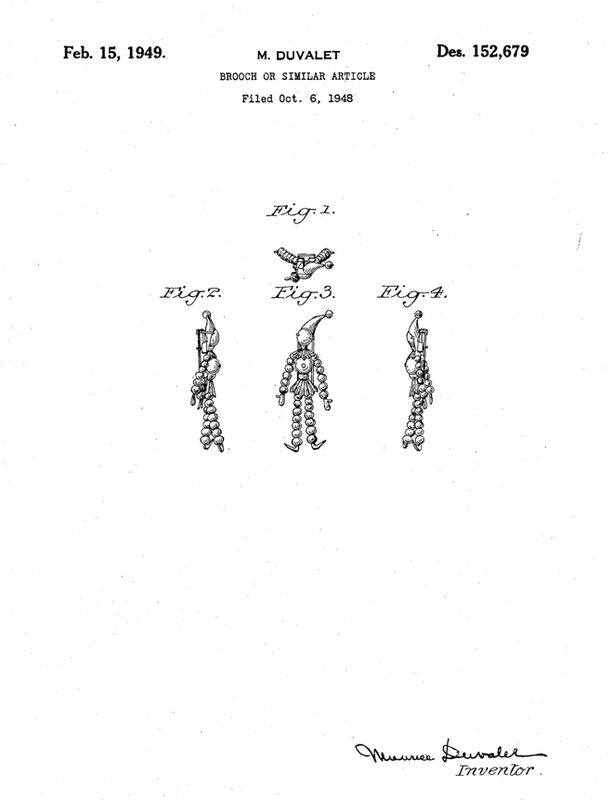 Also the Arpels had close ties with the ballet and were influenced by the great dancers and choreographers of the day. They even approached George Balanchine to produce a ballet entitled ‘Jewels’ where various countries were represented by different precious stones. Duvalet’s, more modest Pierrot, is in the same style. It is made from 18 carat gold, weighing 9.8 grams. The brooch has graduated cultured pearl arms and legs that move, and a cabochon ruby head. It measures approximately 2 inches tall, and is signed and numbered: Van Cleef & Arpels, 15838. This pierrot brooch was originally owned by the tobacco heiress, Doris Duke (1912 – 1993). All Ms. Duke’s jewellery was sold by Christie’s auction house in 2004. Per Doris Duke’s instructions in her will, all of her jewelry was temporarily on display at her home, Rough Point, in Newport, Rhode Island prior to the auction. Her jewelry collection was overwhelming. Duke’s 399 piece jewelry collection was catalogued in Gems From the East and the West, The Doris Duke Jewelry Collection, by Janet Zapata, Ulysses Dietz and Zette Emmons in 2003. Page 102 of the catalogue shows our Pierrot brooch. This entry was posted in Auctions, Books & Catalogues, Celebrity & The Red Carpet, Famous Goldsmiths & Designers, History and tagged Doris Duke, John Rubel & Co., Maurice Duvalet, Van Cleef & Arpels. Bookmark the permalink.